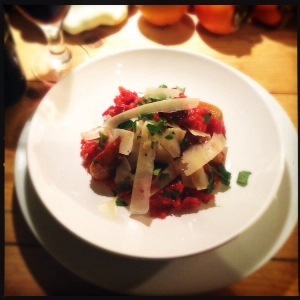 Also known as the garden beet, the beetroot is a sweet, maroon coloured root vegetable. It is a healthy, low-calorie food filled with fiber. It is known to help improve health conditions such as high blood pressure. 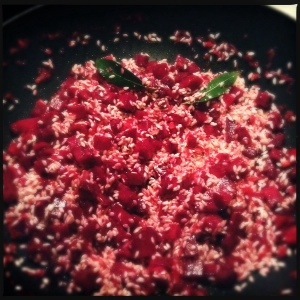 The leaves of the red beet can also be eaten. Beetroot can be consumed in a variety of ways. 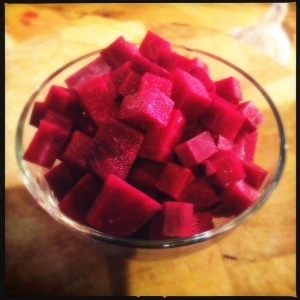 If consumed raw, beets should first be peeled. The top and bottom of the root should also be removed prior to ingesting. 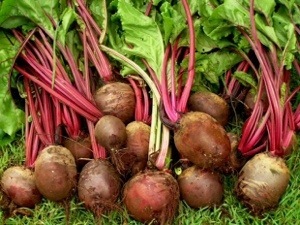 Beets can also be boiled, sautéed, pickled, fried, juiced, steamed, pureed, grilled, or baked. 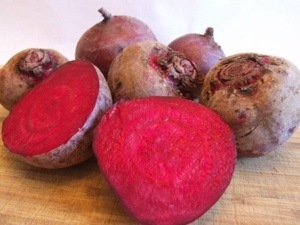 When cooking beets, the skin may be left on until it is loose enough to fall off, retaining the vegetable’s vivid color. Soups made from beets, such as cold borsch, are popular in Europe. Pickled beets are a typical way of serving the plant; these are often served on hamburgers in Australia and New Zealand. Juices from the pickled vegetables are often used to prepare other dishes, such as hardboiled eggs, as well. Another common way of serving the vegetable is as a side dish or salad component. Canned beets are generally considered to have an inferior taste to fresh beets. 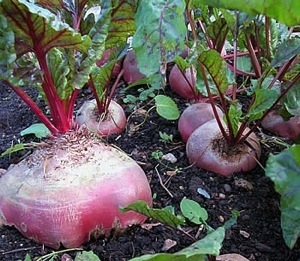 Beetroot can be grown at home by planting seeds following the last frost of the spring. The plants require sparse, weekly watering during the majority of the season, with daily moisture provided on hot days. 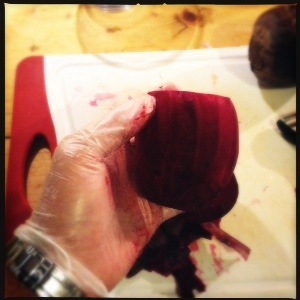 Caution should be used when preparing beetroot. The colorful pigmentation of the vegetable can stain clothing. If consumed in large quantities, the vegetable can also cause discoloration, typically in a shade of pink, of the urine. This light sensitive vegetable will also turn colors when cut and exposed to light. 1. The beetroot we eat now is Beta vulgaris, which evolved as a cultivated version of the sea beet, Beta maritima. 2. 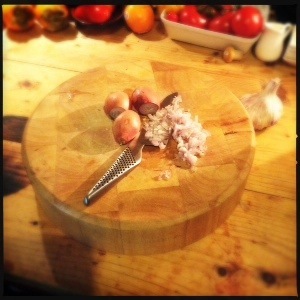 The ancient Greeks offered beetroot to the god Apollo on silver platters at his temple at Delphi. 3. The 17th century herbalist Nicholas Culpeper said that beetroot juice is good for headaches and afflictions of the brain. 4. Martin Chuzzlewit is the only novel by Charles Dickens that mentions beetroot. 5. The sugar beet has been the official state historic vegetable of Utah since 2002. 6. 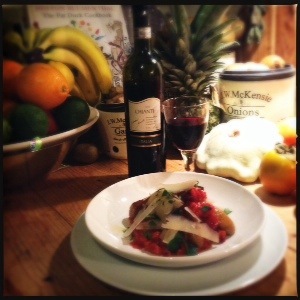 The ancient Romans considered beetroot to be an aphrodisiac. 7. The Lupanare, the official brothel of Pompeii, had its walls decorated with pictures of beetroots. 8. One of Alan Sugar’s (the English entrepreneur )first jobs at the age of 11 involved boiling beetroot for a local greengrocer. 9. When American astronauts on Apollo 18 docked with Russians on Soyuz 19 in 1975, the Russians offered them traditional foods including beetroot and cabbage soup. 10. The world’s biggest beetroot was grown in 2005 by Dutchman Piet de Goede weighing 156lb 10oz. 1, Heat the stock in a saucepan until almost boiling, then reduce heat until barely simmering to keep it hot. 2, Heat the oil in a shallow heavy-based pan. 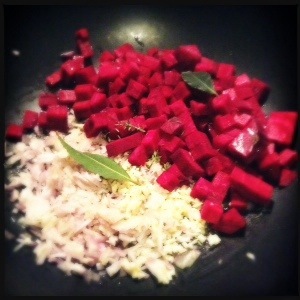 Sauté the shallot, garlic, bay leaves, beetroot and half of the thyme until softened (about 6-8 minutes). 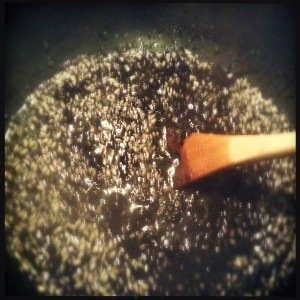 3, Add the rice and stir well until the grains are well coated and glistening. 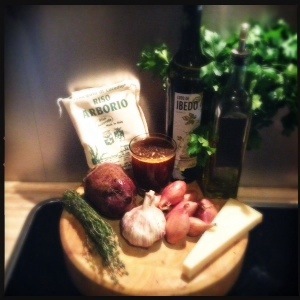 5, add one ladleful of hot stock let it simmer, stirring all the time until it has been absorbed. 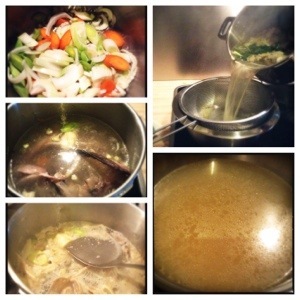 6, Continue to add the stock at intervals and cook as before until the rice is tender but firm. 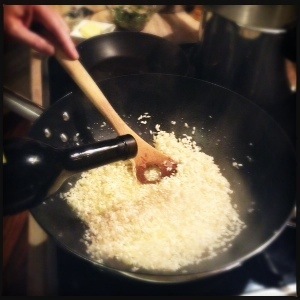 7, Add the butter and most of the cheese and stir gently. 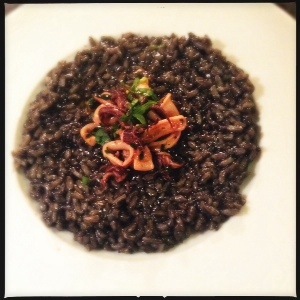 Black risotto or risotto al nero di seppia made using cuttlefish or squid ink is a dramatic looking dish originating from Venice. In my recipe I use homemade fish stock, it is worth the time to make your own stock as It gives a fresher more intense flavour, but stock cubes can be used. 1kg fish bones and skin, preferably bones from white fish , try to avoid oily fish such as salmon or mackerel as it can become bitter. 1. Put all the vegetables into a large pan add the oil, peppercorns, bay leaves and parsley, gently heat to soften but not colour. 2. 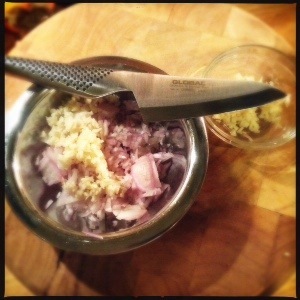 Remove Gil’s from the fish heads and rinse under cold water to remove any blood stains. 3. 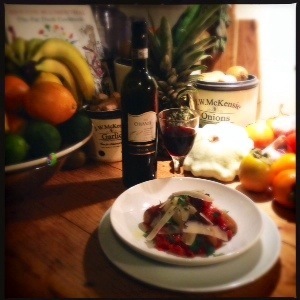 Once vegetables have softened pour in the wine and turn the heat up to cook off the alcohol. 4. Add fish bones and 2 litres of water bring to the boil and skim off any scum that has formed. Any leftover stock can be frozen and kept for 3 months. 1. 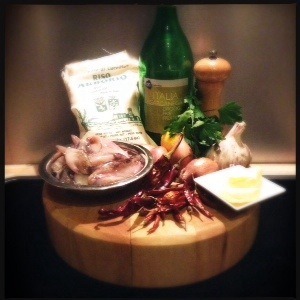 For the risotto, place the chicken stock into a pan and bring to a gentle simmer. 2. Meanwhile, heat another pan until hot and add a splash of olive oil and the butter. 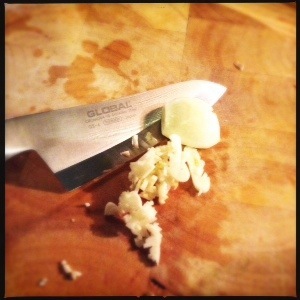 Once the butter has melted, add the onion, half of the garlic and chilli flakes. 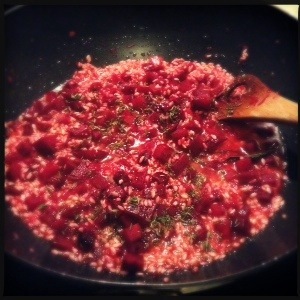 Cook for a few minutes until softened, but not coloured. 3. 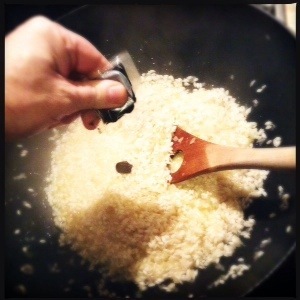 Add the rice to the pan and stir with a wooden spoon until the rice is translucent and coated with the oil. 4. 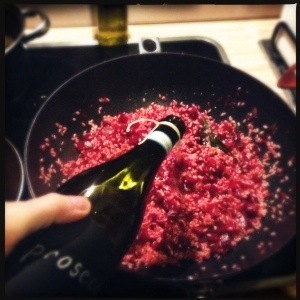 Add the wine and cook until the liquid has reduced by half. 5. 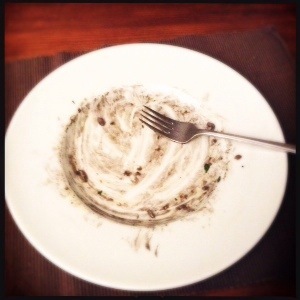 Add the squid ink and stir thoroughly with a wooden spoon to disperse the ink throughout the rice. 6. 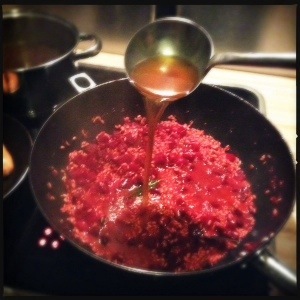 Pour in the hot stock, a ladle at a time, and keep stirring until each ladleful is absorbed. Keep adding the stock, stirring as often as possible until the rice is tender, but still with a slight resistance to the bite – this should take about 20-30 minutes. 7. Meanwhile, clean the squid. 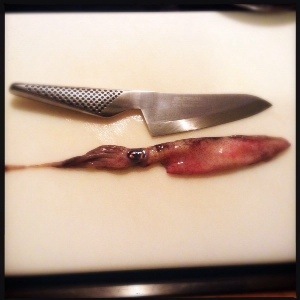 Pull the tentacles away from the squid’s body. Remove the quill from inside the body and discard. Clean the body by running it under a tap or cleaning it in a bowl of water. 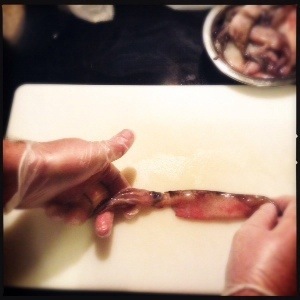 Remove the ‘ears’ from either side of the squid body and remove the skin with your fingers. Cut the tentacles just below the eyes, being sure not to cut the ink sac. Be sure to remove the ‘beak’ at the base of the tentacles. Cut the body of the squid into rings. 9. 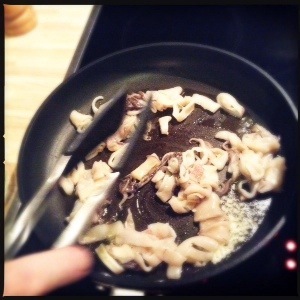 Add splash of olive oil , the rest of the garlic and the squid. Cook on a high heat for 1-2 minutes or until coloured on all sides and just cooked through. 10. 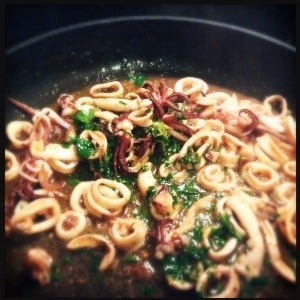 Remove the squid from the heat and place into a bowl. 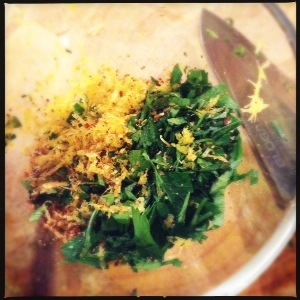 Add the lemon zest, parsley, chilli flakes . Mix together and season with a little salt and freshly ground black pepper.